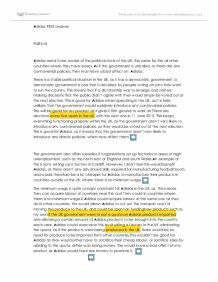 Adidas PEST analysis Political Adidas need to be aware of the political state of the UK, the same for the all other countries where they have bases. As if the government is unstable, or there are any controversial policies, they may have a bad affect on Adidas. There is a stable political situation in the UK, as it has a democratic government, a democratic government is one that is decided, by people voting on who they want to run the country. This means that if a dictatorship was to emerge and started making decisions that the public didn't agree with they would simply be voted out at the next election. This is good for Adidas when operating in the UK, as it is fairly unlikely that the government would suddenly introduce any controversial policies. This will be good for my product as it gives it firm ground to work on.There are elections every five years in the UK, with the next one in 11 June 2015. This keeps everything functioning properly within the UK, as the government aren't very likely to introduce any controversial policies, as they would be voted out at the next election. This is good for Adidas, as it means that the government aren't very likely to introduce any drastic policies, which may affect them. The government also offers subsidies if organisations set up factories in areas of high unemployment, such as the north east of England and south Wales.An example of this is Sony setting up a factory in Cardiff. However, I don't feel this would benefit Adidas, as there aren't any advanced skills required for manufacturing football boots, and would therefore be a lot cheaper for Adidas to manufacture their products in countries outside of the UK, where there is no minimum wage. The minimum wage is quite a major constraint for Adidas in the UK, as this means they can acquire labour at nowhere near the cost they could in countries where there is no minimum wage.If ...read more. Basically, if people have more PDI then the demand for Adidas's products should increase, and decrease if people's PDIs are lower, due to the same reason as unemployment. Social As the UK has a wide selection of people from different social backgrounds, Adidas need to be aware of things like people's religion, race, culture, education levels, population, gender, age distribution, buying habits and lifestyle. Therefore, I need to promote my product so that it appeals to the different social backgrounds of the UK, as this will maximise my sales and enable my product to fulfil its potential market share. The UK is becoming more and more dependant on the Internet, this means that the methods in which people buy goods are changing. Rather than using the traditional method of going to shops and buying products, more and more people are buying goods from the Internet. This is because people have less time on their hands and the Internet is the quickest and easiest method in which to buy goods. Adidas need to recognise this fact and I will be selling my product online. Another method commonly used in the UK to buy goods is mail order; I will also be using this method of sale so that my product is widely available to people with different kinds of buying habits. Adidas also need to recognise the frequency, or how often people tend to buy certain goods. For example most people would buy 1 or 2 pairs of football boots per season. Taking this into consideration, I will be investing money into promoting my product in the pre-season stage, as this is the time in which most people buy their football boots. Also, I will be updating my product at this stage (pre-season) each year for the same reason as above. I feel Adidas have already noticed the times at which they receive the most sales, as they use lots of advertising campaigns in the pre-season stage and also before and during large international football competitions such as the World Cup and the European Championships. ...read more. � Advertising Standards Authority (ASA) In order to follow rules and laws set by the Press Complaints Commission, Trade Descriptions Act and Sales and Supply of Goods Act, Adidas have to ensure their products are of a high quality by ensuring it is produced with high quality materials and by well trained personnel. If they weren't to do this, less people would buy the products as they would be of a lower quality and also Adidas would get fined due to breaking the rules of the above laws and commissions. This would have a bad affect on my product, as there would be less money available to fund my product and any promotions I wish to initiate. When Adidas are advertising over the TV, they need to acquire a broadcasting license for the advertisement, to stay in line with rules set by the Independent Television Commission. To acquiring this license Adidas need to make sure that the advertisement had no verbally or sexually explicit content otherwise the advert wouldn't have had a license granted, meaning that the advert wouldn't be seen by anyone and this may be reflected in a drop in sales. Also, Adidas need to make sure all their promotions give a true representation the products being advertised, as to not break the laws of the Trade Descriptions Act. Adidas need to make sure all of their retailers have sufficient knowledge of Adidas products in order to obey the Trade Descriptions Act, as if Adidas give the retailers sufficient information and they give customers incorrect information about the product, then it is the retailer breaking the Trade Descriptions Act rather than the manufacturer. Finally, the Equal Opportunities Act needs to be considered by Adidas, this stops Adidas from discriminating against things like gender, race, disability and criminal records. As if Adidas didn't do this a large number of people wouldn't buy their products if Adidas were prejudice to their gender, race, disabilities etc, therefore, they would lose money, which could have been spent on funding my product. ...read more. The Act also introduced a new form of incorporation; the Charitable Incorporated Organization (CIO) designed specifically for charities that will allow trustees to form a company without needing dual registration with both the Charity Commission and Companies House. Position 3 is an intermediary position between cost and differentiation; position 4 is a differentiation strategy that corresponds to Porter's differentiation; position 5 is a focus differentiation strategy more or less similar to market differentiation Porter's strategy. The last positions 6, 7 and 8 are failure strategies. In UK Vodafone has an important position with more than 16ml customers. The company tries to maintain a high public profile following the latest trends, always developing new technologies, and offering high quality services. Vodafone UK is very concerned about how its business impacts the community and is committed to developing a reputation as a responsible firm. The reason why I decided to ask the store owner what the target audience was is that because it was a small business, the owner is most likely a sole trader which means that he makes most of the decisions when it comes to the layout of the store and items to be sold. * Email - This will be used to pass on a message to multiple people and you won't have to keep saying it. * A Report - This will be used to keep facts and figures on the business that can be looked back on if needed. Describe the products &amp;amp; services provided by the London eye and Wookey Hole Caves. The gift shop offers a range of good quality London eye gifts and souvenirs to help make the visitors experience on the London eye special. Capsule Photography as visitors nearly reach the end of their capsule sightsee, there is an automated photo system where a picture is taken of everyone inside each capsule. I will also widen the range of the market exploration. Data and Graph Analysis Data Questions Number Percentage 1. Are you male or female? Male 6 40% Female 9 60% 1. What is your age group? 15 -16 5 33% 17-18 10 66% 1.